Yep, that stuff in the brown bottles is sold at the drug store so that you can use it on finger infection, cuts, and skin infections of all kinds. Since hydrogen peroxide kills germs, it is great to use on any kind of skin infection. But, it stings! You can soak the infected finger in 3% hydrogen peroxide solution. It takes a while to work. You can try to dab some peroxide on, but it tends to just run off. And it needs some time to work! You can try to get the hydrogen peroxide to stay on the infection longer by soaking a cotton ball or tissue and then holding it on the infected cut. But, that still only works sort of. If you repeat this often, it may work well enough. Another option is to make yourself some “sticky” hydrogen peroxide gel. This works in situations where you need the hydrogen peroxide to really stick in place. I use 3% hydrogen peroxide on cuts that are not infected, to prevent infection. It stings! I've been told that this does not make the cut heal any faster, but it seems like it does! Perhaps it just seems faster because infection doesn't develop? Do not use hydrogen peroxide on deep or serious wounds, it is dangerous. 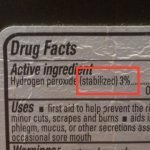 Is hydrogen peroxide a pierced ear infection cure?